Rikki became a Compound Archery Coach with the GB Paralympic Squad after a successful career as an archer herself. 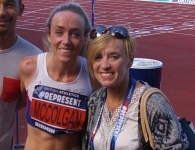 With World and European silver medals to her name, she has a wealth of experience to pass onto her athletes as she heads towards the Paralympics in Rio 2016, with an added extra challenge of having had a baby in early 2015. Can you tell us about your sporting background and about your career so far in Archery? I started archery when I was 7 and competed for GB for the first time using the Olympic style recurve bow as a junior when I was 18. I was never quite good enough as a senior to make the Olympic squad so in 2006 I changed discipline to the compound bow to bring some enjoyment back to the sport. I took to this discipline like a duck to water, it felt so natural and I found I loved the technical aspect of it. I first made the British team with this bow style in 2009 where we won a Team Silver Medal at the World Indoor Championships. I then continued to compete for GB every year apart from 2012, where I chose not to following the birth of my son. I finally retired from competitive archery, with another team silver medal at the European Championships this time, in September 2014 when I was 5 months pregnant with my daughter. In 2013 I was asked by our Paralympic Head Coach to assist on a project to find and develop compound archers for a new Paralympic category that is being introduced in Rio. This developed into a permanent job at the start of 2014 and since then I have been working with our podium, podium potential and academy athletes assisting our head coach. Was becoming a coach always a part of your plan as an athlete? Was the transition a natural one? I’d not really considered coaching as a profession. As compound archery is not an Olympic sport it receives no funding from UK sport so I have always had to work and then train and compete in my spare time. Coaching was something I did occasionally at our club or for our county but wasn’t something I ever saw as a career – I was an Insurance Broker! When I had my first child I left my job in Insurance and took a job in our local archery shop so I could work part time hours. This enabled me to improve my technical knowledge and day to day I was teaching people to shoot and setting up equipment and I found it really enjoyable, working in the sport I had loved my whole life. When I got the job with Archery GB I found the transition quite easy from athlete to coach. It helped that our sport is so integrated, so I knew most of the athletes that I would be working with as we had competed together in the past. When I’d worked with people on one off coaching days or in the shop they were always looking for a quick fix, and to me that isn’t coaching. It’s much nicer to have time to work with people and develop changes and now I can work through changes and problems with the athletes as I would’ve worked through them myself. For those who have never taken part in Archery before, can you explain to us what a Compound Archer is? A compound bow is a short bow which looks like it’s got wheels top and bottom. These are in fact cams which generate much more speed than the traditional recurve (Olympic style) bow. It has a magnified scope to aim with and rather than pulling it back with your fingers you shoot it using a handheld mechanical trigger device. The Olympic style recurve bow gets heavier the further you pull the string back and it’s at it’s heaviest weight (between 30 – 50lbs) during the aiming phase of the shot. With a compound bow when it’s pulled back it is very heavy to start with, reaching a peak weight between 30 – 60lbs, but when it’s all the way back this drops off by 65-80% so you are only holding between 10 – 20lbs when aiming. It is currently not a discipline in the Olympics but is used in the Paralympics and all other major events around the World (world cups, world champs, world games etc.) and 2/3 of the Paralympic medals will be won in compound categories from Rio onwards. Can you tell us about your role as Paralympic Compound Coach, what is involved day to day? Day to day I work primarily with our compound archers both male and female, helping them with their equipment (set up, maintenance, testing) and technique. I work with the archers alongside other specialists such as our Physio, S&C coach, Psychologist & Biomechanist ensuring that our squad can perform as well as possible at Rio. I also travel at home and abroad with the team to our national and international competitions and training trips coaching the athletes and working as their agent (someone who goes to the target to score and collect their arrows for them). Coaching Paralympic athletes is a bit more challenging than an able bodied athlete as there are always other things you need to think about, like ‘how can we make this work from sitting in a chair’ or ‘how can we do this with a prosthetic limb’. It is also more physical, we have to move the luggage and equipment, load wheelchairs and sometimes the athletes on and off buses etc. What is the situation like with female coaches in Archery? Within our performance unit the split is 50/50 but this is not reflective of the situation in the UK and I believe the rest of the World. In particular the number of female compound coaches that I know of around the World I could probably count on one hand. I have found that I have had to work really hard to prove that I am technically competent. When I worked in the archery shop a great number of men would go straight to my male colleagues saying that only ‘they’ could help them even though I had a great deal more expertise. Fellow athletes, particularly on the men’s end of the line could be very patronising when talking technical, to the point that they would actually talk over me during a conversation. I feel that this attitude and the effort it takes to overcome it does put women off going down the coaching route. I am hoping that by seeing female coaches working at the top level it will convince other women that coaching is a viable vocation. You are currently on maternity leave from your coaching role, how is it going? It’s going well thank you, I have a very healthy and happy little girl. Yes, I am finding it difficult being away from my coaching role but I’m trying to stay as involved as possible. At my request our head coach is giving me weekly updates, copying me in on important e-mails and sending me videos of the athletes. I do worry about having time out leading up to the Paralympics but I did try and plan, as best we could, the timing of this baby to have the least impact. I’m not worried that my time out will affect our archers because we ensured that there was an excellent replacement to cover me but I do worry about being out of the coaching environment for 6 months; technology moves on quite quickly and I’m going back half way through a season having not had a chance to play and experiment with the new bows. With Rio 2016 being your first Paralympics as a Coach and your first as a Mum, how are you currently feeling about the prospect of leaving your young children for such a long time for the first time? The prospect of going to the games is really exciting but being away for nearly 3 weeks does make me feel sad and guilty, especially as I will miss my sons first day at school. I’m just so grateful for my amazing husband and family who support me and look after the kids whilst I’m gone. I’m also very grateful for the technology we have these days, being able to Skype them daily keeps us all relatively sane. Do you have any plans to compete again yourself? Eventually yes. I both competed and coached last year but it meant I was abroad for nearly 7 weeks and away somewhere in the UK most weekends and this would only get worse leading up to the games. Hopefully in 2017 I can find some time to compete again, though I’m sure the kids hobbies will soon take over. What one piece of advice / or a general coaching tip, would you give to other female coaches? I’ve come to understand and accept that we will never be as physically strong as the men, but by understanding our bodies and focusing on technique we can do what the men can do without brute force and ignorance. A lot of male coaches don’t take the time to learn this and we do it naturally and this should be our gift to share.